Monday, November 14th, 2011 | Author: Bunco Betty! Hello there fellow bunco babes! I have to say, my bunco night turned out to be a blast! No one knew of the secret place after our bunco game and it stayed that way until we pulled up to the building. I think a few of them saw it coming, considering that I am the one who expresses herself as much as I can. 😉 Most all of the fab ladies knew that I had taken some pole dance classes before but never thought I would bring my bunco group to have some spins around the pole themselves. Everyone brought yummy bunco appetizers and drinks and we filled our belly’s with as much as possible. We had so much fun! I think it was the first bunco game that we’ve had with an extra player! The ante was $5 (keeping it simple) and I won for the most losses! I gathered everyone in the kitchen and we chose drivers to get us all to the secret destination safely and hit the road. Some had wine, some had vodka and others had beer in hand as we walked into Teeze dance studio. A couple jaws dropped…I could hear their minds going a mile a minute…they were thinking…ok….what the hell are we doing here? Are we really going to play around on this STRIPPER POLE?!? Oh yes indeed…I was the first one on there with smiles to show that it wasn’t scary and it’s ok to find our inner diva! We turned the music up and poured our drinks and the party began. Everyone had a turn…and loved it! Laughter, music and our own little dance club! It was fabulous!! After awhile I gathered everyone in a big circle on the floor to have a round of LCR…our other favorite dice game. SO much fun! The winner won $54!!! By this time hours had gone by at our own little dance club and after a ton of pictures and too many drinks…it became time to head out. Some ended up taking a cab and the best part of the night is everyone made it home safely. I feel great! It was my first time hosting and I wanted to make it memorable…and I am 100% sure it will be. 😉 I don’t think I scared anyone away…and I know for sure that the fab ladies now know that if you go outside of your comfort zone…good, fun things can happen! I have the bunco kit at my place and my daughter is loving it! She keeps using the cute bunco pens to practice her ABC’s and she loves ringing the bell. I have all the tally sheets and score cards for the next time we meet. It shall be so much fun! I have the best set of bunco friends! Thank you ladies for your fun times and great stories! Celebrate breast cancer awareness by inviting your bunco group and network of friends to a pink ribbon themed bunco party or fundraiser with the new Bunco Game Shop’s “Bunko for Breast Cancer Starter Kit“. Each Bunko for Breast Cancer Starter Kit contains 1 Pink Ribbon Tote Bag, 1 Large Pink Fuzzy Die, 1 Bell, 9 Pink with Black Pip (dots) Dice, 1 Tablet of Bunco Score Sheets (50 sheets), and 6 Pink Ribbon “ROLL BUNCO” pencils. 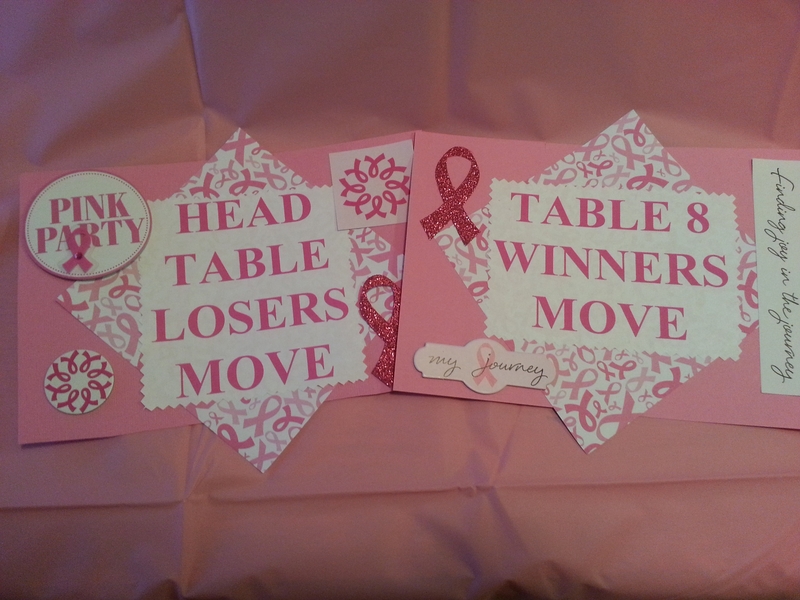 Next time you host bunco night, organize a Bunko For Breast Cancer party, where you can “roll the dice and beat the odds!, and we will donate an additional $1 in your name for each “Bunco for Breast Cancer Starter Kit” purchased. Bunco for Breast Cancer events can be held with your “official” bunco group at your home, or you can go all out and invite your entire network of friends to join you at a event center for a community wide “Bunko for Breast Cancer” extravaganza! “Your chance of winning Bunco is 1:12. In the U.S., the chance of a woman being diagnosed with invasive breast cancer in her lifetime is about 1 in 8.” (source of statistic: The American Cancer Society). You can make a difference! Start planning your Bunko for Breast Cancer party today! Hello bunco players! We take the stress out of your bunco parties and fundraisers by providing all of the information and tools you need to host fun and highly successful events! You can visit us anytime to solve all your bunco needs at Bunco Game Shop.